Climate protection – let’s dare it together! Try out the good life of the future. “District Future – Urban Lab” is a research and development project of the Karlsruhe Institute of Technology (KIT) that wants to make a whole district of the city and its people fit for the future. The question is: How can we live a good life in the city today and tomorrow – and at the same time respect the world we are part of, the world that surrounds us, and the world to come? In doing so, we will not extensively remodel what we already have, but change it gently – in a joint effort between citizens, science, politics, and the private sector. Bring pioneer ideas into play. Sustainable urban development, one of the most urgent challenges of the 21st century, is thus promoted with creative strategies: Pioneering ideas are investigated, further developed, and tested, alternative ways of life are closely examined, technological and societal innovations are brought into play. A vivid culture of sustainability. While many people only think of renouncement or efficiency when it comes to sustainability, District Future – Urban Lab is about creating new qualities of life for the people in the quarter: The city is nudged and encouraged to a culture of sustainability which enters the life of the people through their feelings, thoughts, and actions. This is based on an understanding of sustainability which focuses its actions on a global, intergenerational justice. The driving forces? All of us. The future has to do with us and concerns all of us. Therefore everyone can join in the urban development of Karlsruhe’s Oststadt, where participation of the urban society is the driving force. District Future – Urban Lab serves as creative platform here, is an experimental space, and springboard for a large number of projects with a sustainability aspect. The real driving forces behind the change are Karlsruhe’s citizens themselves, their clubs, companies, schools, and initiatives with their very own project ideas. Everyone is invited to join in! Urban society meets KIT meets urban society. The co-operation of science and urban society, of scientific and practical knowledge enlarges the people’s scope of action: KIT opens up to the region, its knowledge becoming a useful and concrete contribution to the neighborhood. Vice versa, the citizens as team of experts for the local challenges ahead also contribute to the institution with crucial impulses from their everyday lives. The District Future’s scientific team co-ordinates and moderates the sustainability work in the quarter and accompanies the process with its research work. The focus is on city life as a whole, the way in which the people in the district encounter it every day: Fields like economy and consumption, work, education, or nutrition are considered as an interwoven web and integratively analyzed. Everything is related, everything is important. They do not think in subjects any more, but focus on transdisciplinary methods: Environmental scientists confer with people from the Oststadt, experts in urban development and migration researchers sit at the same table, sociologists discuss with experts in mobility. In this way, new and potentially sustainable ideas for different fields of life are brought into contact at one place. And while sustainability in the district is woven tighter and tighter, threads can be handed on, conflicting aims can be identified, and solutions can be found. District Future – a European sustainability model to copy. We can assume that almost two thirds of the world population will be living in cities in 2050. Therefore it makes sense to try and test sustainability right there, in the urban space. Karlsruhe’s Oststadt, a typical European district which has developed over time, can be used as a model for other urban living environments in Europe. The diversity and complexity of communal life in the district is the real ace up the sleeve here: Regarding urban and spatial development, there are quite different structures; people with different backgrounds and life plans come together and form a society. Karlsruhe’s Oststadt becomes a dense microcosm which provides a platform to work on complex interrelations and big questions on the small scale. An integrative concept of sustainable development made in Karlsruhe. District Future – Urban Lab takes sustainable development, one of the mission statements of the United Nations, seriously. Starting point for the project is the Integrative Concept of Sustainable Development, a scientific and ethical concept which has been developed by the Helmholtz Association at the Institute for Technology Assessment and Systems Analysis (ITAS) in Karlsruhe. It respects both today’s and future generations and combines thinking in global contexts with local actions. The main goals are to ensure human existence and provide basic services for all people, to maintain the social potential to produce goods and services, and retain the possibilities for development and actions of people and societies. However, every society has to decide for itself how it wants to shape sustainable development. Urban space is diverse. The topics of District Future – Urban Lab too. Cities are the main cause of and principal sufferer from climate change. We have to deal with extreme weather conditions like heat and heavy rainfall and at same time we have to change our actions to make them more climate-friendly. Cities are resource-hungry and produce too much CO2. We can change this: by using innovative technologies and renewable energies and trying out a new way of life that works without the excessive waste of goods and resources. Mobility in the city is too often harmful to the environment and nerve-racking. We think about a mobility concept which relies on bicycles, smart traffic management systems, and collective means of transport. Today’s cities produce a vast quantity of waste. We want to approach tomorrow’s recycle city, where waste becomes a resource and the raw material for new products. Consumption has an effect – on the world we are part of, the world that surrounds us, the world to come, and ourselves. We want to contribute to a conscious, sustainable, and regional consumption and revive cultural skills like barter and repair. Since the resources of our planet are finite, a growth-oriented economic system cannot work in the long run. We contemplate how the good life in an urban post-growth society could look like. 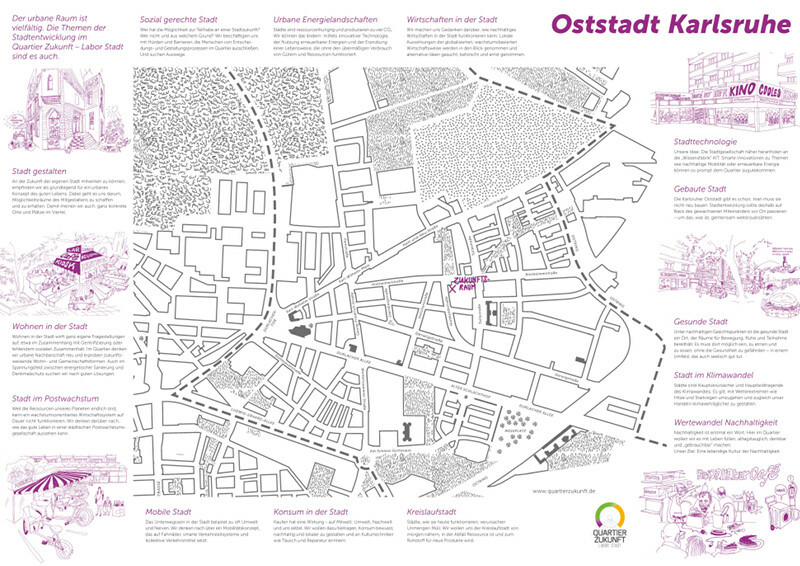 Karlsruhe’s Oststadt exists already, it does not have to be built. Urban development should therefore be based on the existing local community – to continue together what is already there. Living in the city raises its very own questions, for example regarding gentrification or the lack of social solidarity. In the district, we re-consider urban neighborhoods and put future-oriented forms of living and community to a test. We are also looking for solutions to the conflicting priorities of energetic redevelopment and listed buildings. First of all, sustainability is just a word. Here in the district, we want to fill it with life, make it suitable for everyday use, imaginable, and “usable”. Our goal: A vivid culture of sustainability. Our idea: Bring the urban society closer to the “knowledge factory” KIT. Like this, the district can immediately benefit from smart innovations on topics like sustainable mobility or renewable energy. From the sustainable perspective, the healthy city is a place which provides room for physical activities, rest, and participation. It has to be possible to breath and eat there without endangering your health – in an environment that is also good for your soul. We are also concerned about sustainable economic activities in the city. We do not only examine local effects of a globalized, growth-based way of doing business, we also search for alternative ideas, research them, and take them seriously. We are convinced that the possibility of contributing to the future of our own city is an essential aspect of the urban concept of good life. We want to create and preserve an opportunity for co-creation. For us, this also includes specific venues and locations in the quarter. Who is entitled to participate in an urban future? Who is not and why? We take a closer look at the obstacles and barriers that exclude people from decisions and design process in the district. And try to find solutions. What happens to my wishes for the District Future? Tell us your wishes and ideas for the development of the District Future. Let us know what you think. What is important to you? What is not? We will collect your comments and present them promptly on this website in order to discuss them further and incorporate them into the development process of the District Future. Interdisciplinarity is a type of research that brings different disciplines together while working on a common research question. This interaction can create synergy effects, new knowledge and also the necessary vocabulary. Interdisciplinarity has gained more and more attention in recent years. Activating participation aims at enabling work on an equal footing and a worthy way of dealing with all opinions in a transparent process. All positions are equally acknowledged and appreciated, allowing for co-creating and decision making. Making those involved aware of their different perceptions can lead to learning processes resulting in a joint solution. A real-world experiment (also called sustainability experiment) is a scientific method that allows scientist to work together with the project partners and citizens on socially relevant questions regarding sustainability. The experiments are rooted in actual lifeworld contexts in terms of time, space, and social conditions. Scientists intervene in the running experiment, accompany the process, and reflect its results. A real-world lab is a geographic and societal space in which a large variety of long-term sustainability experiments take place and are analyzed regarding their synergies and conflicts. The aim is to launch and foster sustainable development and a culture of sustainability in a common process between science and local actors. The knowledge gained during their realization should be transferred to other regions and contexts (model character). Sustainability means treating knowledge, values, natural and social resources in a responsible, well-considered, and mindful way. Like this, we can make sure that future generations will have the same access to nature as a basis for food, energy, and health as we have today. That means that everyone has to be responsible for their own actions in local and global terms. It is about making independent and conscious decisions and passing this ability on to other people. It is about a good life today and tomorrow while respecting the world that surrounds us and the world we are part of. Complex societal challenges cannot be answered within individual disciplines. Therefore we need transdisciplinary approaches where societal and scientific actors work together on a common goal – finding solutions for a good future. This intensive process combines local know-how with scientific knowledge and has to give the participants time for getting to know, understand, and trust each other. Based on their shared questions, individual motivations and interests are discussed, negotiated, and taken into account in a transparent way. All partici­pants work as equal partners.